If you work with Excel, you undoubtedly have been asked to create summaries of your work. Sales reports, invoices, forecasts, schedules, you name it. You know what all these documents have in common? They look great in PDF form. You know what else? Management loves PDFs! I’m going to present each of the macros with some commentary. That way, you’ll be able to quickly find them, copy them to your VBA editor and use them. When you run any of these macros, a Save As dialog box will appear asking you where you want to save your PDF. The default name includes the date and timestamp when you executed the macro in yyyymmdd_hhmmss format. This one is my personal favorite. This macro will convert the cells you actively have selected into a PDF. MsgBox "No File Selected. 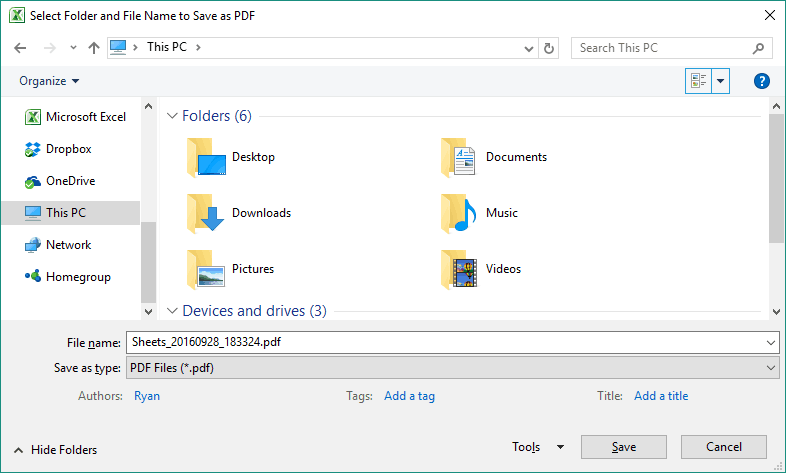 PDF will not be saved", vbOKOnly, "No File Selected"
Once you select the range and click OK, it will show a dialog box where you can select where you want to save the PDF. It will automatically pick the date and time from your system’s clock and add it to the file name. A lot of Excel power users store their data into organized tables. As a matter of fact, Sumit Bansal himself likes Excel tables so much he calls them a hidden treasure in Excel. This macro prints a table of your choosing to a PDF. When you run the macro, it will prompt you for the name of the table you want to save. Once you enter the name of the table and click OK, it will show a dialog box where you can select where you want to save the PDF. If your spreadsheet has several tables and you need to save each one to a separate PDF, you can run this VBA code. 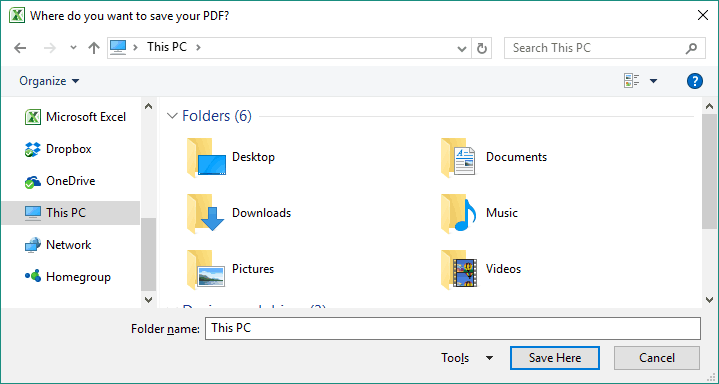 When you run this macro, a dialog box will appear asking you to select the folder where you want to save your PDFs. Once you pick your folder, the macro will save each table to a PDF with the table name conveniently appearing in the title of the PDF. .Title = "Where do you want to save your PDF?" I don’t know about you, but in my line of work, we have to retain PDF copies of almost all our spreadsheets. We append the PDF copies of our spreadsheets to our design calculations. These PDFs used to be converted to microfiche and vaulted for long-term retention. You know, in case the apocalypse happened. MsgBox "A PDF cannot be created because no sheets were found. ", , "No Sheets Found"
MsgBox "A PDF cannot be created because no Chart Sheets were found. ", , "No Chart Sheets Found"
This macro saves all your normal charts – chart objects – into a single PDF. Regardless of which worksheet your chart is on, it will be grabbed and saved to a PDF. There will only be one chart per page in the final PDF.
' MsgBox "No File Selected. PDF will not be saved", vbOKOnly, "No File Selected"
If you have any questions, drop them in the comments section, where Ryan and I will be waiting there for you. How to Embed a PDF File in an Excel Worksheet. Excel VBA Loops &#8211; For Next, Do While, Do Until, For Each (with Examples). How to Record a Macro in Excel &#8211; A Step by Step Guide. About the author: Ryan Wells is a Nuclear Engineer and professional VBA Developer. He publishes his easy to understand Excel VBA tutorials to help others write better macros. In addition to teaching VBA, Ryan is the lead developer of several Excel add-ins. You can find his tutorials on WellsR.com. hello, i have a sheet that has a pivot and that pivot pulls in multiple different products with information below, is there a macro where i can name all of the products and it will create a pdf for every single product off the pivot without have to go one by one? I have a invoice Template with VBA code as below which Prints 4 Copies of Invoice With Changing Cell value (L1) in each sheet with Array as defined in Macro. I need to save this as PDF file as wellafter printing with all these 4 Sheet in a single PDF file with continuous 4 pages each having cell value(L1) as defined by Array. Any Advice in this regard shall be highly appreciated. Is there a way to have a predetermined set of cells selected already as opposed to being prompted? and also have all that fit in one page as either landscape or portrait. Is there a way, when exporting as PDF. to have a print title row (which I currently have put into all the pages of the .pdf), appear on all of the pages EXCEPT the final page? I have an Invoice program, which I had made with LibreOffice. In this program, there are two workbooks. First one is a stock file, where I keep the records of each item in the inventory such as description, cost, selling price, Tariff Code, etc. Second workbook has a link to the first one so if I make any changes, it automatically updates with the new values. In the second workbook, I simply enter order code and quantities and it fills the invoice template. For each page, there are 25 entries. So if the invoice has more than 25 items, it automatically goes to second page. That way, I made the design up to 10 pages. Also in this workbook, in another sheet, there is the sales contract, which is automatically filled again according to the date, customer id, and invoice number. What I want to ask you is, I can make this program in Excel, too. Can you offer a VBA code, which will understand how many pages of the invoice is filled and convert to PDF accordingly along with adding the Sales Contract sheet automatically ?